Look at those cuppies, don't they just look beautiful? Makes you feel so loved ya? 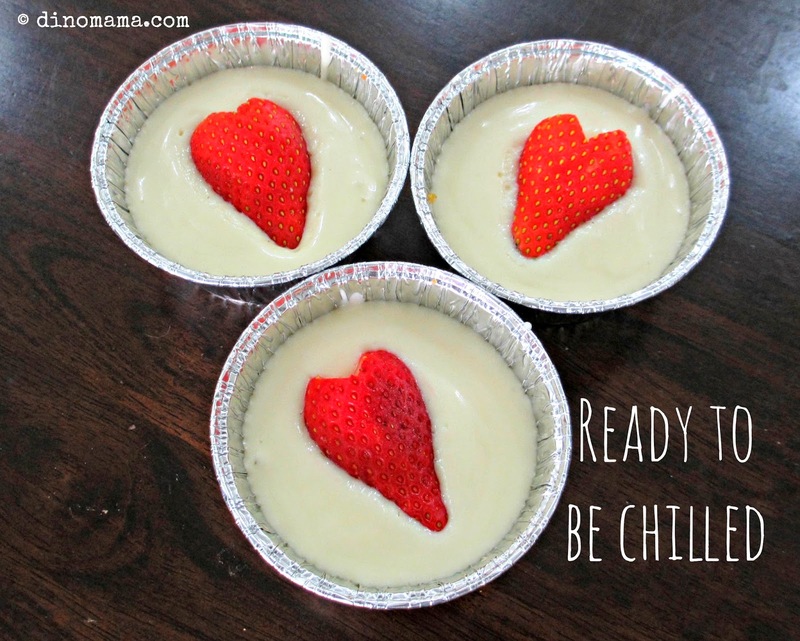 I had no intention of making any more cheesecakes after the previous two cheesecakes I made not long ago, but an SOS posted by a friend in a cooking group made me want to do it again. 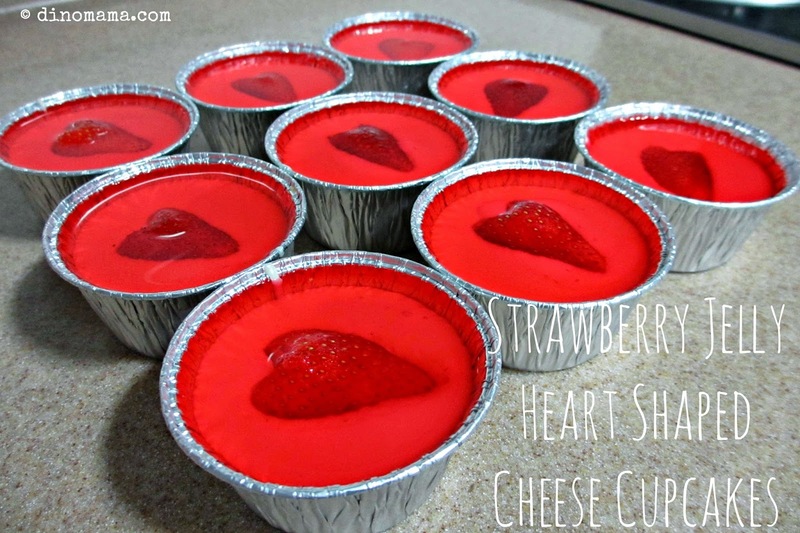 This friend was making the Strawberry Heart Jelly Cheesecake and when she poured the jelly onto the cheese there were bits of floating cheese. That was her X number of times she made it and still she get the floating cheese, she couldn't understand the reason since she followed the recipe steps closely. I was curious and decided to try it out, I asked this friend for the recipe and she directed me to Storyofbing website. 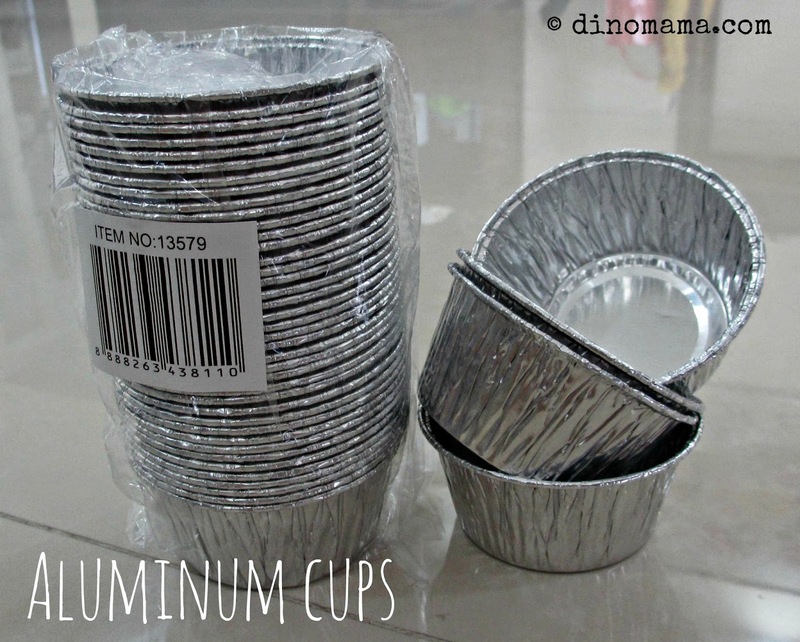 So, the cake was made in a glass pan which I do not have, I thought I'd do cuppies instead, and got myself a packet of aluminum cuppies like the one in the photo from Phoon Huat. I gathered all the ingredients (thank goodness the supermarkets were having a buy 2 at cheaper price plus a cute little egg shaped timer promo for Philadiaphia cream cheese so I have some extra packet in the fridge) and start to make the cheesecake. I crushed the digestive biscuits (if you want to know how I did it, head off to my No Bake Mango Cheesecake post), melted the butter using the double boiling method, whisked the cream cheese with sugar and about an hour later my beautiful strawberries were sitting nicely on the cheese and was sent into the fridge for chilling. I used 2 different type of jelly powder because 1. I did not read the recipe clearly (was distracted by something and rushing through) and missed out reading about the hot & cold water method 2. Its been donkey years since I last bought jelly powder and I have forgotten that when it has cooled down it solidified. 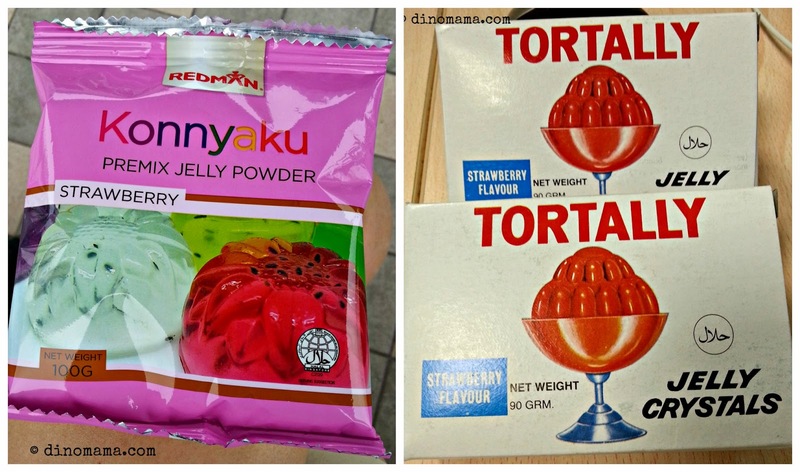 So I wasted the Konnyaku jelly powder and just to play safe I bought 2 packets of Tortally jelly powder the next day. If you are using Tortally jelly powder perhaps you may want to make a little adjustment. I used 150ml hot water with 180ml chilled water and the jelly is too sweet for our liking. You can either add more water, use half or ¾ packet instead, just do a taste test when the powder has fully dissolved and adjust accordingly. As for Konnyaku jelly I didn't get a chance to taste it so am not sure about the sweetness. Please let me know about the sweetness if you used this type of jelly powder. And then it reached the nerve breaking part... will I have floating cheese in my jelly when I pour them in??? I asked my experienced baking friends and they suggested that I poured the jelly over the back of the spoon and let it flow slowly onto the cheese. This method will ensure that the flow of the jelly does not have any great impact and causing the cheese to break up. After doing that for 2 cuppies I decided that it is not necessary for me to use this method as the cheese seems to have set in well enough so I simply just spoon the jelly gently onto it directly. It was a slow process but I finally finished adding the jelly onto my 9 cuppies and its back into the fridge for more chilling. 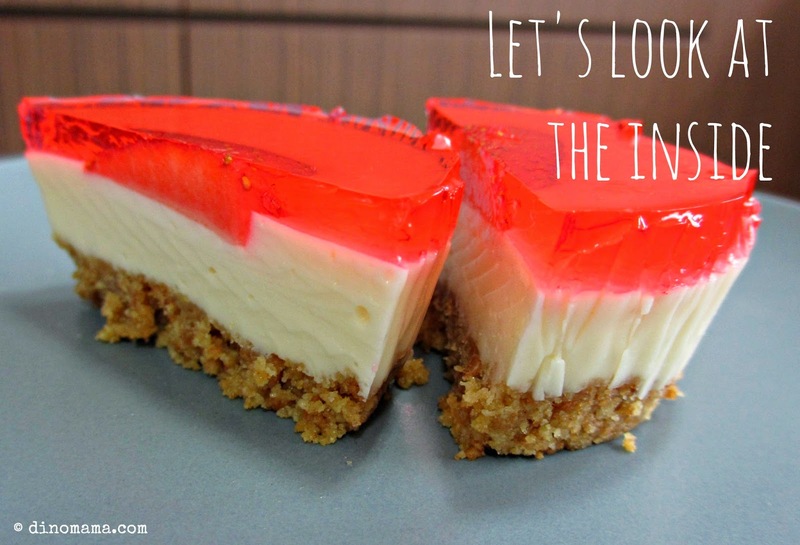 The next night I took one out excitedly and tore away the aluminum cup revealing the red and white tempting dessert. Before I can sink my teeth onto it I have to cut it into half and take photos to show every one the inside of the cheesecake. They look beautiful though not perfect, the base is too thick, it would taste better if they were thinner. One thing to take note, the original recipe calls for 500g cream cheese but I only used 250g because I thought its too much plus I googled and most recipe only requires 250g. Anyway, with 250g of cream cheese I was only able to make 9 cuppies and left with half the amount of crushed digestive biscuits. I am not sure whether it's the reduced cream cheese but my cheese cake does not taste cheesy enough. On top of that it's a little bit hard, I should have guessed it since I did not reduce the gelatin. Also, since I messed up the jelly my cheese cuppies were able to chill in the fridge for over 24 hours. They probably have more than enough time to set so the cheese will not disintegrate. Thus me and that friend concluded that the most important thing is "CHILL CHILL CHILL!!!" Even though the recipe says chill for at least X number of hours, you can let it chill further, it'll probably do more good then harm. 4. If you are using a glass pan, grease the pan generously with butter. The recipe is for 13 X 10 X 2 inch glass pan. 5. Empty the mixed contents onto glass pan. Use the back of a spoon or spatula to smooth out the mixture and press it down. For cups, just spoon in enough mixture and press it down with the back of a teaspoon. 6. Put it into the freezer to set while you prepare the cream cheese. 7. 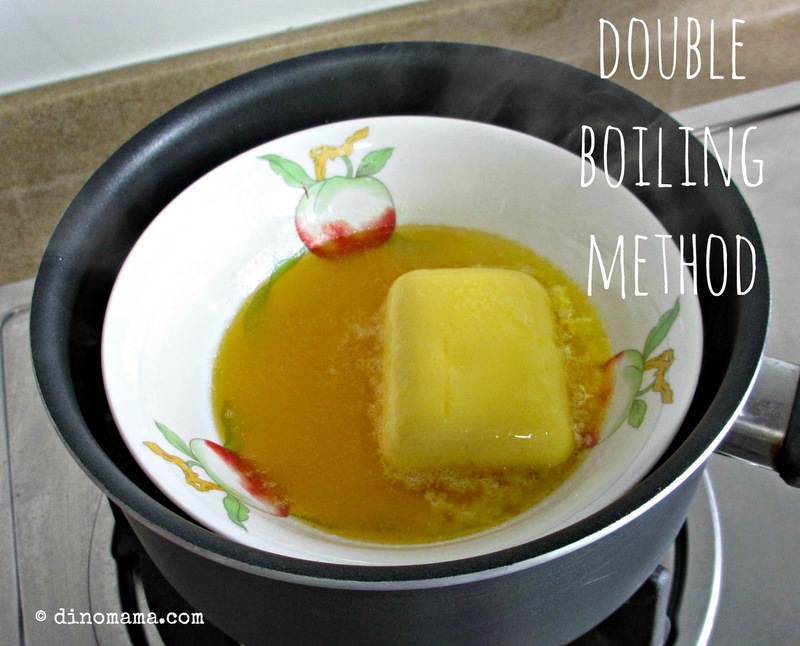 Dissolve the gelatin powder with water using microwave on medium-high heat for a minute or till mixture is all dissolved or use the double boiling method. Set aside to allow it to cool down. 8. In a mixing bowl, combine the cream cheese and the sugar. Whisk well on low speed till mixture is creamy. 9. Add in the vanilla essence and gelatin mixture. Whisk well on low speed till well combined. 10. Pour mixture into glass pan or spoon it into the cups. Smooth the top as much as you can with the spatula. 11. Let the mixture rest in room temperature for about 10 minutes. 12. Prepare the strawberries by cutting them into half, slice off the white tops with the leaves and cut a deep V in the centre. 13. 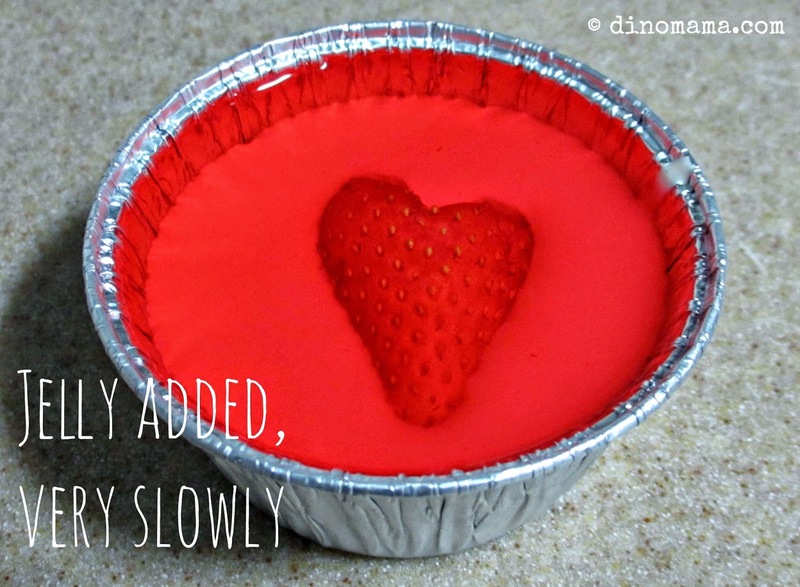 Press each strawberry half way into the cream cheese mixture with 1 inch to 1.5 inches apart. Let the strawberry sink in gently. If the strawberries don’t sink in, they will float up in the jelly layer later. 14. Cover the pan with cling film wrap & place the pan in the fridge. Chill for at least 4 hours or overnight. If the cheese layer is not well chilled, the cheese will disintegrate when the jelly layer is added. 15. Prepare the jelly 4 hours later. Empty the jelly powder into a bowl and add in 1 and 1/2 cup of hot boiling water. Stir until the jelly powder has fully dissolved. 16. Add in 1 and 1/2 cup of cold water and mix well. 17. Ensure that the jelly-water mixture has cooled. If the mixture is still hot, it will melt the cheese layer and cause bits of cheese to float in the jelly layer. Gently pour the cooled mixture over the cream cheese layer over the back of a spoon. 18. Cover the pan with cling film wrap again and chill for another 4 hours. I did not cover my cups but you can do it if you want. 1. Use a sharp knife with a thin blade to cut the jelly hearts. Prepare a large jar of boiling water. Dip the knife into the water. Wipe it off and cut. Repeat that with every cut to get a nice clean cut with no crumbs sticking at the sides. 2. If you lined the pan with baking paper, the crust should not stick to the pan. If you didn’t line with baking paper, set the pan on a hot/warm surface for a few minutes before removing the jelly hearts. The heat will warm the butter at the base and make it easier to remove the jelly hearts. Next time we plan to meet up I make one for u ok? 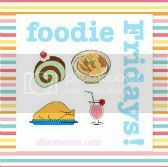 This seems to be very tasty and soooo cute! I like it because it's a different way to cook the cheesecake.